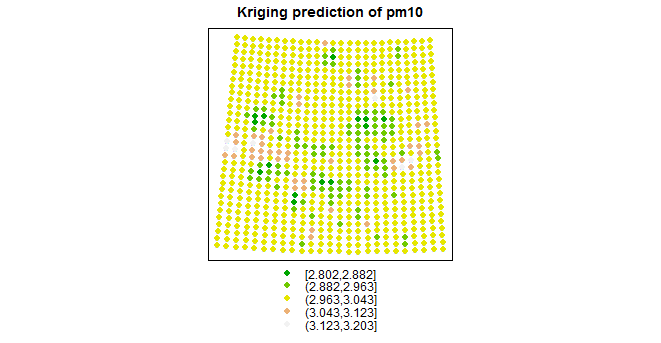 I want to do kriging with external drift(universal kriging) in R. The covariate I use is in WGS84 refrence system. Because of nature of kriging which calculates distance in planar surface I have to do transformation from WGS84 to ETRS89. what I want out of kriging is a raster map. Because of the reference system transformation the prediction points are not regular grids and what I get as a result is a vector map. I used 'gstat' package in and spplot() function to create plots. But When grids are regular (wich I can not define because of nature of the covariate data) with equal distance I have a raster map. generate a regular grid of points in the lat-long coordinate system, transform to ETRS89 using spTransform, and plug those points into whatever kriging package you are using (you don't say, you don't give examples), get the estimates, and back-transform with spTransform to lat-long. do your kriging in a regular grid in your ETRS89 system, then convert the output to a raster package object, then warp the raster to lat-long. I'd prefer the first option, and I'd convert the output to a raster package object as well. Not the answer you're looking for? Browse other questions tagged r kriging or ask your own question. Confidence intervals on raster produced by kriging spatial interpolation? Explaining different results from Ordinary Kriging and Universal Kriging?